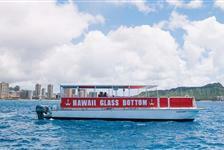 Climb aboard a Hawaii Glass Bottom Boat and take a ride out into the beautiful Pacific. 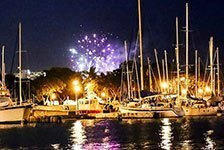 Take in the beauty of Hawaii's South Shore and watch for sea life like sea turtles, dolphins, fish eels, and reef sharks through the viewports. Hawaii Glass Bottom Boat offers day and nighttime cruises and sails, each offering a unique experience and glimpse into underwater activity. Book a glass bottom boat ride for your Oahu vacation.